We have been a part of DIHAG Holding GmbH since 1996. Ten long-established foundries have come together here to form a rock-solid enterprise. Thanks to its use of latest technology as well as it long-standing experience, DIHAG manufactures approx 170,000 tons of castings every year. A total of 2000 highly qualified employees work at the individual locations to produce highly demanding casting products for a wide range of branches. The group is a leader in the field of shipbuilding, iron and steel industry and wind energy engineering. The international clients value the competence of the enterprise throughout the value-added chain: right from designing to manufacturing and prefabrication to timely delivery and a comprehensive service. As an innovative development partner and a reliable supplier, the DIHAG group thus strengthens the competitiveness of its customers in the long term. Security and independence through diversification is the key to success of DIHAG HOLDING. The group supplies a variety of different customers, including many blue-chip companies, with a wide range of products. The industry mix ranges from wind power to shipbuilding, machinery and mechanical engineering to mining and rail transport iron and steel. In addition to its specialisation in highly profitable markets, the diversification of DIHAG ensures stable sales. This is a sound base to realise future growth opportunities through the development of new markets. Germany is traditionally the largest market, where DIHAG HOLDING achieves around half of its turnover, followed by the rest of Europe, Asia and South America. 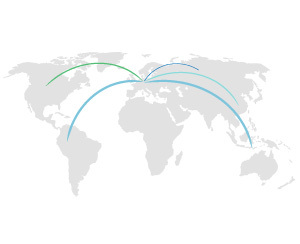 The greatest potential for growth which DIHAG would like to exploit over the next few years lies in the markets of Eastern Europe, Russia and North America.